We all got pretty excited when we heard Volvo were about to launch a new “Sports Coupe” and immediately our minds flew back to the 480ES of the 1980s, and the P1800ES before that with a young Roger Moore at the wheel. Whilst the C30 is indeed a very pretty little car and harps back to its predecessors particularly as far as the use of the all glass tailgate is concerned, it isn’t a spiritual successor. The Volvo C30 is an exceptionally good looking car (some have called it exquisite), it reminds you of the pretty girl sitting up the corner in a disco that does not get noticed and it’s only when you take a close look that you realise how attractive she actually is. To describe the C30’s styling as subtle is an understatement, but taken in isolation, it’s got some lovely parts and if you are a car fan like me, you begin to really appreciate the whole through the parts. The C30 sits low and really has a sporty appearance, whilst its wheel in each corner design, wide track and long wheelbase, doesn’t just make the C30 really stable, it also maximises the cars cabin space. All C30’s are 3 door cars, and whilst front seat passengers will have plenty of legroom, it’s a different deal for rear seat passengers who need to be pretty agile to squeeze into what really isn’t a big space. The C30 has 4 seats, so the rear of the car takes just two passengers and frankly, there simply isn’t enough legroom to let adults sit squarely unless, they are extras from the Lord of The Rings. Despite Volvo’s advertising strap for the C30 referring to it as “A Coupe That Spoils its Passengers”, Haken Abrahamsson, Volvos C30 Project Director has said that customers “will rarely use the back seat” which kind of makes you wonder what these people were thinking when they designed a car with a full 4 seats that you cant properly use and it makes you wonder what other compromises (that you can’t see) that have been made in an effort to create this pretty little car. Being Scandinavians, they seem to have decided to offset the cars very pretty exterior and “balance it all up” by fitting some nice quality bland items such as the floating console which in itself is lovely, but is mated it to an exceptionally boring dashboard, which Volvo would probably prefer to be described as simple and uncluttered. The C30’s steering wheel is pretty large, but it’s pleasant to sit behind and transmits plenty of feel from the road. We tested the 2.0D which chucks out 134bhp at 4,000 rpm and 320nm of torque at just 2000rpm, so it’s a gutsy engine. Performance wise, the 0-62 thrash took 9.4 seconds and Volvo claims a 130mph top end. Strangely, the figures for the 2litre petrol are exactly the same. In terms of recommendation, the 1.6 diesel is a superb engine, and to show how good it is, it’s the same engine that been chosen for the Ford Focus, Citroen C4, Peugeot 308, Mazda 3, to mention just a few. Whilst the 2.0 is torquier, it’s also harsher and its power is delivered in big chunks. The sweet little 1.6 however offers a great blend of diesel economy yet delivers the same characteristics you would expect from a torquey petrol engine. There are four different specification options, ranging from the lead-in “R Design Sport”, the “R Design SE Sport”. the SE and the SE Lux. Version. There are 4 petrol engine choices, 3 diesels and a 1.8 multi-fuel. The C30 ranges in price from a touch under £15,000, going way up to £21,495 for the range topping SE Lux T5 which shares the same fire-breathing 220PS 2.5 turbo engine as the Ford Focus ST.
Volvo have always been famous for building safety features into its cars and the C30 is no different, regardless of the model you choose as all C30’s share the same safety equipment, which includes the famous Volvo SIPS (Side Impact Protection System), with side airbags, dual stage front airbags and an inflatable curtain. The cars also have ABS, with Electronic Brake Distribution (EBD), Electronic Brake Assistance (EBA) and the WHIPS, Whiplash Protection System. So it’s likely, that if you buy this Volvo, you’ve a better than average chance of surviving until your next trade-in time. We liked the C30, a lot because it was a little unusual and was simply a beautiful thing to look at. 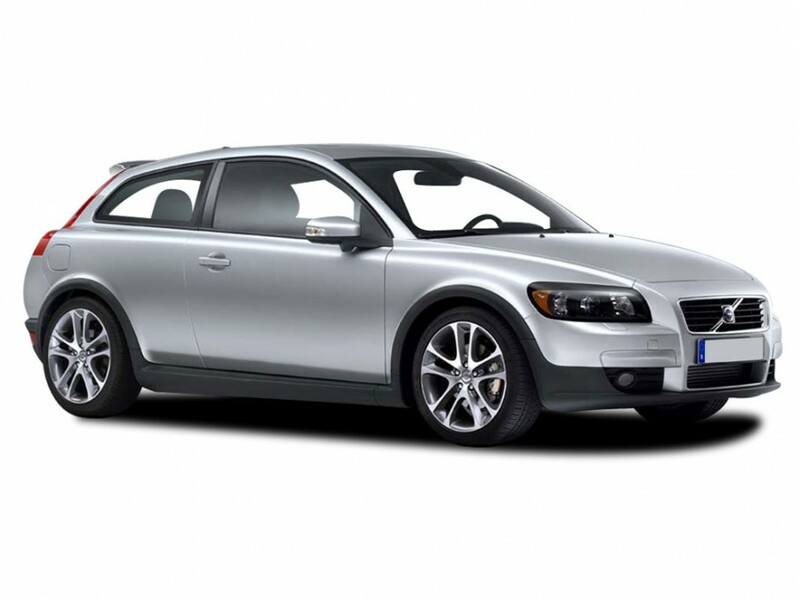 We couldn’t fault what it did, or the way it drives and as the Focus which it shares so much of its DNA with is a truly excellent car, we feel we can recommend the Volvo C30. However, if you want to carry 4 or 5 adults, the Volvo C30 isn’t going to be the car for you. I guess summing it up, I like unusual and different things and I like my car to get noticed and yes to be honest, I am a bit snobby when it comes to the brands of product I buy, so on that basis, the C30 ticks all the boxes. However, if I were putting my Wurzell Gummidge sensible head on, it would have to be its half brother the Ford Focus which took my order (purely because of its rear seats), albeit the Volvo is dressed in a much more attractive and exclusive set of clothes. Volvo are pretty pleased with the C30 and expect 75% of its customers to be new to Volvo and most likely to be young couples without children and “empty nesters” looking for some safe excitement. The C30 is the kind of car that young people can choose as a fashion statement, but as it’s a Volvo, the older people amongst us can drive it as well, without everyone thinking we are having a mid-life crisis. For a quotation on the Volvo C30 or any other car in the Volvo range, please do not hesitate to contact us.